Green comes to life every day at the University of Oregon's Center for Sustainable Business Practices. Housed in one of the nation's most environmentally friendly business school facilities, the center is at the forefront of thinking about how to balance social, environmental, and financial responsibilities. For us, the market demand for transparency, sustainability, and business responsiveness just makes sense. In fact, Oregon and the Pacific Northwest—with its natural beauty, array of outdoor opportunities, and appreciation for the environment—continue to be a nexus of sustainable business management practices, new startups, and innovations. Many companies in Oregon's hallmark industries—electronics, wood products, consumer products, and green building—have earned reputations for world-class supply chain and operations management. And Oregon is an international leader in environmental quality, sustainability, and corporate social responsibility. In many ways, the Center for Sustainable Business Practices is about evolving and converging the region's enterprising culture in these fields to create new understanding and to foster strategies that help businesses thrive—with global reach and impact. Students affiliated with the Center for Sustainable Business Practices can take advantage of the UO's world-renowned green chemistry education and research, highly regarded architecture and green design program, or our environmental/natural resources law center, as well as choose from electives in such disciplines as economics, public relations, nonprofit management, environmental studies, and dispute resolution. Sustainability, after all, cuts across all business sectors and academic disciplines because it is ultimately about integration and balance—between profit and values, work and life, theory and practice. 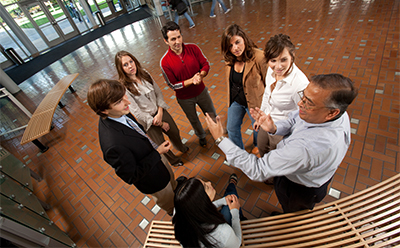 Applying theory in real-world consulting projects develops an understanding of sustainable business practices from strategic, operational, and tactical perspectives. Those are the tools of success. 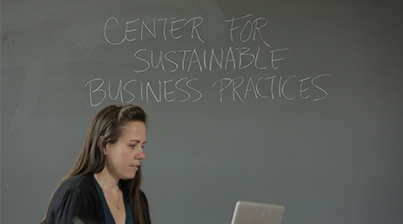 The Center for Sustainable Business Practices promotes innovative experiential initiatives that forge ties between curriculum and practice. Students gain access to leading scholars and practitioners and apply their knowledge in live consulting projects that require them to address real problems and deliver solutions that can be implemented. And client companies obtain access to leading-edge ideas and practices, actionable analyses and recommendations, and potential future employees. Companies who have worked with our students represent the variety of businesses in the Pacific Northwest—small and large, for profit and not for profit, manufacturing and service oriented, public and private. At the heart of the center is our growing faculty: the thought leaders who advance Oregon's reputation for sustainable business innovation. Our faculty members conduct research on many dimensions of sustainability and influence discussions both in academics and in corporate boardrooms. They are at the forefront of the latest issues in and approaches to sustainable business. Through our faculty, leading research and teaching come together. Partners of the Center for Sustainable Business Practices provide valuable assistance and strategic support for the center’s mission, furthering research and scholarship, ensuring that our curriculum reflects industry needs, providing career opportunities, and building a network among the region and the country’s active stakeholders and participants in sustainable business. We welcome other companies and individuals who wish to partner with the center. Please contact the college's Development and External Relations office at 541-346-1346 or visit the college's giving page.